Two weather monitoring masts for the East Anglia Offshore Wind Zone were installed in August 2013. Image: courtesy of ScottishPower Renewables. Siemens has been selected as the preferred bidder for supplying the turbines for the East Anglia ONE project. Image: courtesy of ScottishPower Renewables. 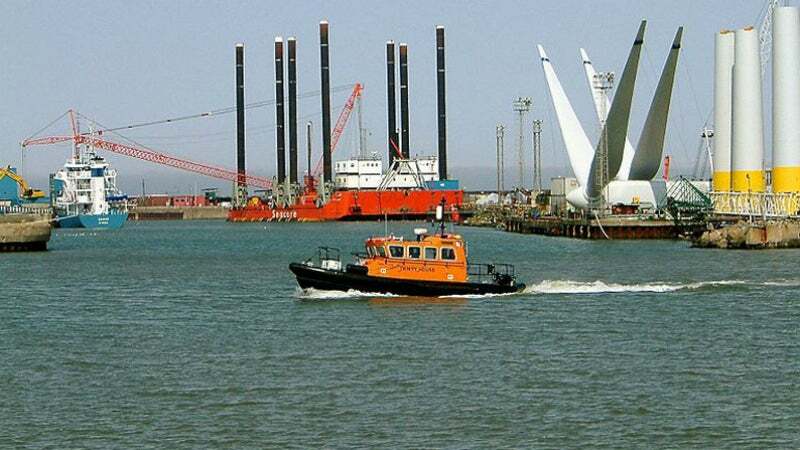 The construction and operations hub for ScottishPower Renewables’ East Anglia ONE project is located at the Port of Lowestoft. Image: courtesy of Martin Petitt. The 714MW East Anglia ONE Offshore Wind Farm will be located approximately 43km off the Suffolk Coast in the southern North Sea, UK. The project is being developed with an estimated investment of £2.5bn ($3bn approximately). In December 2009, East Anglia Offshore Wind (EAOW), the 50:50 joint venture (JV) of Vattenfall and ScottishPower Renewables, was awarded the development rights for the East Anglia Offshore Wind Zone under the Crown Estate’s Round Three Offshore Wind Plan. Public project consultations were initiated in 2010 and the JV received the development consent for the East Anglia ONE project from the Department of Energy and Climate Change (DECC) in June 2014. The JV is currently advancing the development of the 1,200MW East Anglia THREE and the 1,200MW East Anglia FOUR wind farms. The East Anglia ONE is being solely developed by ScottishPower Renewables, which became a subsidiary of Iberdrola Renovables as a result of the acquisition of Vattenfall’s 50% share in the project in March 2015. ScottishPower Renewables has a planning consent for up to 1,200MW in the East Anglia ONE project. The development of the full project will be, however, subject to securing further capacity in future contract for difference (CfD) auctions, a platform through which renewable power projects receive financial support for the power they produce. "The project will also help the UK achieve its target of reducing greenhouse gas emissions by 34% by 2020 and at least 80% by 2050 as part of its Climate Change Act 2008." The 300km² East Anglia ONE offshore wind farm will be installed with 102 Siemens 7MW turbines. Associated facilities to transfer the power to the grid will primarily include an offshore substation platform, two 73km subsea cables to transfer the power to the landfall site in Bawdsey, six 37km each onshore cables to transfer the power to a transformer station, and an onshore substation adjacent to the existing substation at Bramford, Suffolk, where the power will be enhanced to feed the National Grid. The project will also involve the construction of eight cable ducts to accommodate the capacity of two future East Anglia projects. The construction and operations hub for the project is located at the Port of Lowestoft, where construction activities to accommodate the project facilities were initiated in 2016. The port has agreed to serve the project for 30 years, based on a £25m ($37m approximately) deal agreed in November 2015. Selected as the preferred turbine supplier for the project in June 2015, Siemens plans to construct the turbine blades at its manufacturing facility in Hull. The turbine jacket study for the project was conducted by Atkins Global. Brown & May Marine was contracted by EAOW to provide support in conducting the fisheries liaison work as part of the project’s development. Gardline Hydro was contracted to conduct seabed surveys for the offshore zone in July 2010. It deployed the Confidante and Tridens 1 vessels to conduct the survey for more than three months. Cefas was contracted in April 2012, to collect meteorological and oceanographic data for the project. Cefas deployed three-directional wave-rider buoys and two current-profiling devices for a period of 12 months. Two advanced weather monitoring masts were installed in August 2013, one located to the north of the East Anglia development zone and one to the South. The £17m ($25m approximately) contract for the same was awarded in October 2012 to Wood Group, who further collaborated with SgurrEnergy and Steel Engineering of Renfrewshire. In January 2017, Van Oord secured a contract from ScottishPower for the installation of 102 three-legged jacket foundations for the project. VBMS received a €100m cable installation contract from ScottishPower for the East Anglia offshore wind farm. Nexans subcontracted DeepOcean for marine installation activities such as crossings and cable protection. A2SEA is responsible to install 102 turbines at the East Anglia wind farm. Navantia and Windar were subcontracted by Iberdrola to provide foundations for the East Anglia wind turbines. Navantia is responsible for providing 34 jackets, while Windar will mould the jacket piles at its facilities in Aviles. Lamprell was contracted to fabricate jackets and piles for the wind farm. The scope of the contract includes procurement, fabrication and supply of 60 foundations for the wind farm.